The identity of this CostaRican band is composed of a powerful live act and a more delicate and ethereal recording. The band has the musical talent and drive to stand out in their local market and had great recognition during their past tour to Mexico. Live 424 transforms the experience of recording their album in a makeshift studio in a sustainable community next to Central Americas largest rainforest into a one of a kind live act. 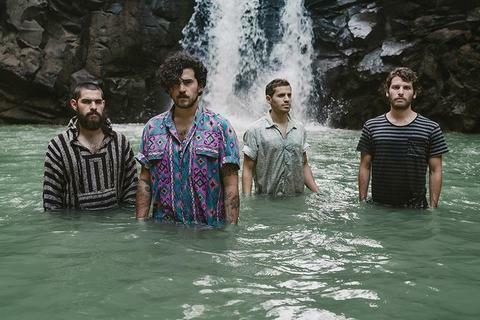 They present a delicate and moody sound that is not typically found in Costa Rican rock with heavy rock riffs sometimes finely in the background and their lamentful lyrics which are front and center. Their acclaimed debut album ORO comes after a short lifespan, the band originating in April 24, 2009 (hence the name 424) and releasing a self titled EP in 2010. Produced by experienced british producer Phil Vinall, Oro is captivating and unique. 424 is regarded as to look for act for 2014 after participating of Costa Ricas major music festivals, being signed to Charco and distributed by Casete in Mexico after their first tour to that market.